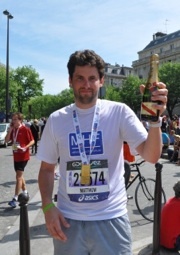 Congratulations to the Forum's fleet-footed development manager Matt Maycock who finished last week-end's Paris marathon, run in blistering heat, in less than four hours. Matt even gave up drinking to prepare for his third marathon to raise money for the MHF (although judging by the photo this abstinence did not continue long after he'd crossed the finish line). Matt reports that he ran the whole way - apart from giving his wife a 'quick kiss at 30km' - and clocked 3 hours 59 minutes. He says: 'Other than the expected blisters I am not feeling too bad.' He even claimed that he would be playing tennis today. Hmm.